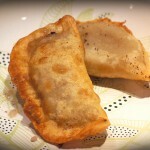 Chebureki are basically deep-fried stuffed patties. It’s a traditional dish of Turks, Mongolians and Crimean Tatars, and popular in the Russian Caucasus region along with Romania, Uzbekistan and Tajikistan. Usually the stuffing is meat such as lamb or beef mixed with pork, onions and various spices, but you can also use vegetables, mushrooms, cheese, or even fruits. There are many different recipes for the dough and fillings, but this recipe is one of the most traditional and easiest to make. I added a little garlic powder to the meat. You can add different spices depending on your taste, but don’t add too much, or it will overwhelm the flavor of the meat. 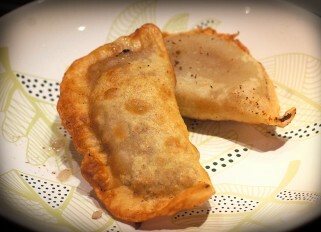 Onions keep the chebureki filling moist, but also I use a little water or sometimes kefir or low-fat yogurt. You can also grate 1 tomato on a coarse grater and add to stuffing instead of water. To prepare the dough, sift 1 cup of flour and mix with 1 tsp salt. Pour 1 cup of boiling water and stir with a fork or spoon a couple of minutes then by hand, about 10-15 minutes gradually adding 1 cup of sifted flour. Roll the dough into a ball, cover with plastic and leave in the refrigerator for 30 to 60 minutes. Finely chop the onion, mix with minced pork and beef, add salt, pepper, parsley, cilantro, 100 g of water and stir. Divide the finished dough into 12 pieces, and roll out each into a ball. Sprinkle lightly with flour. Roll out the ball into a thin round ‘pancake’. Coat with water or egg white around the edges. Add 1-2 tbsp of stuffing on one half of ‘pancake’, smooth with spoon the stuffing and cover the top with the other half of the ‘pancake’, forcing the air out. Carefully press the edges together. Repeat with the remaining dough. Heat the oil in a large skillet. Chebureki must ‘swim’ in the oil and don’t touch the bottom or each other. Cook the chebureki over medium heat on both sides until dark golden brown then put them on a paper towel. Serve immediately.